Israel has relatively low employment rates and those who are employed work more hours than is common in the West – but produce less per hour. Hence, average Israeli incomes are lower than would be expected given the country’s innovative ability. A country’s total economic output (GDP) depends on the number of people who work and the amount that each working person produces. As shown in the May 2011 Bulletin and updated by Taub Center Executive Director Dan Ben-David in the upcoming State of the Nation Report 2013, when the share of employed individuals in the working age population is relatively high, and the average amount produced during each work hour is relatively high – what is commonly referred to as labor productivity – then individuals can work fewer hours while their standard of living (as commonly measured by GDP per capita) may be higher. While greater productivity is no guarantee of higher wages, small amounts produced per hour cannot support high hourly wages. For wages to be high and for wages to rise over time, high and increasing productivity is necessary. Across the Western world, the past several decades have been witness to declining employment rates among men accompanied by rising employment rates for women. This has also been the case in Israel. While female employment among the non-Haredim (i.e., non-ultra-Orthodox) is relatively high and has offset the very low rates of employment among Haredi and Arab Israeli women, the overall situation among Israeli men has been quite problematic. 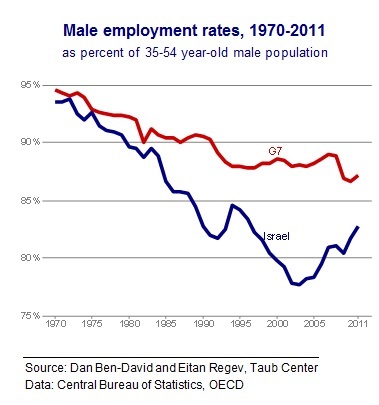 As indicated in the first figure, employment among prime working age men – 35-54 year-olds – has declined in Israel at a considerably faster pace than in the G7 countries (the United States, Canada, the United Kingdom, Germany, France, Italy, and Japan). Despite the negative employment bubbles coinciding with the huge immigration wave from the former Soviet Union in the early 1990s, and the very deep recession in Israel of a decade ago during the massive wave of terrorism accompanying the second intifada, the subsequent recoveries have not offset the much sharper long-term employment decline in Israel. (It is possible that a substantial part of the large 2012 employment increase is due to methodological survey improvements implemented that year by the country’s Central Bureau of Statistics and not the result of an actual rise in employment.) Even after the recent decade of recovery in Israel, and despite the G7’s descent into its worst recession since the Great Depression of the 1930s, the employment gap between Israel and the G7 is considerably greater than it was three to four decades ago. Consequently, employment among prime working age Israelis is much lower than average employment in the leading developed countries. 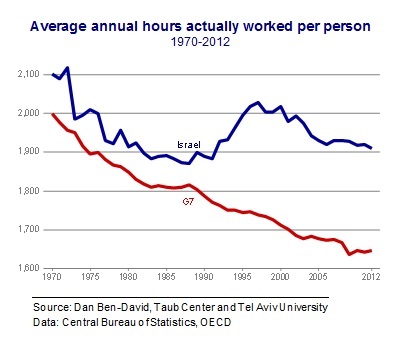 While fewer Israelis work compared to the G7 countries, those Israelis who are employed work many more hours per week, as can be seen in the second figure. 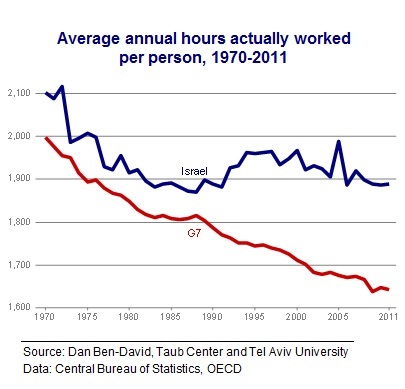 In fact, employed Israelis have been working more hours since the 1970s. But as work hours in the G7 countries have been steadily declining over the past four decades, the number of hours worked by the average Israeli in 2012 was comparable to the number of hours worked roughly three decades earlier – though it has also been falling since the end of the 1990s. While employed Israelis work many more hours today than their compatriots in the G7 countries, Israeli labor productivity is rising at a much slower pace than average G7 productivity. The amount produced by the average Israeli and the average G7 worker was nearly the same in the mid-1970s. 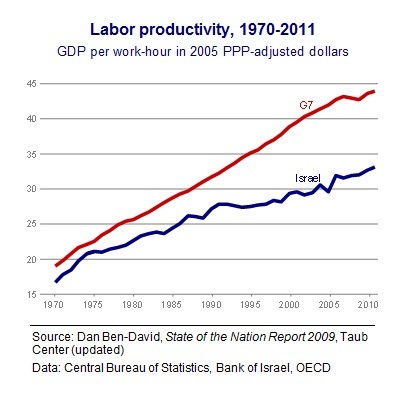 As can be seen in the third figure, Israeli labor productivity has been falling further and further behind the G7 for the past four decades (the sharp productivity decline in 2012 appears to be primarily a reflection of the substantial correction in labor force statistics implemented that year by the Central Bureau of Statistics) – and the question is why? After all, productivity growth requires innovation, and as the recent book by Senor and Singer states, Israel is indeed a “Start-Up Nation.1” So how could a country with some of the world’s leading universities and cutting-edge high tech be falling steadily behind? The answer is that there are really two Israel’s in one. In addition to the “start-up nation” Israel, there is another segment of the population that is not receiving the tools or the conditions to work in a modern, competitive, global economy. Not only is this portion of the population huge, it is growing and acting as a large and growing weight on the rest of the nation. This weight is pulling the productivity and employment ever further away from the leading developed countries. In addition, the poor state of Israel’s primary and secondary education system has played a major role in inhibiting the development of the country’s human capital infrastructure. While the educational achievement of the country’s children in core curriculum subjects is poor overall, it is particularly low among Haredi and Arab Israeli pupils who now comprise almost half of the country’s primary school pupils – with enrollment increases in their schools far exceeding any growth in enrollment in the remaining schools. An influx of large numbers of relatively uneducated and unskilled foreign workers – at one point reaching one out of every eight workers in the business sector – only exacerbates the issue of low human capital in the labor market (see “Israel’s Labor Market” by Dan Ben-David in the State of the Nation Report 2009). The relatively low skill level of a large portion of the local population mitigates the need for inundating the economy with additional workers from abroad who are similarly poorly educated, yet large numbers of foreign workers continue to receive work permits in the country. As the fourth figure shows, there is also a severe problem with the country’s physical capital infrastructure. Worker productivity is critically dependent on the availability of sufficient capital, which in turn requires a sufficient level of investment, or capital formation. 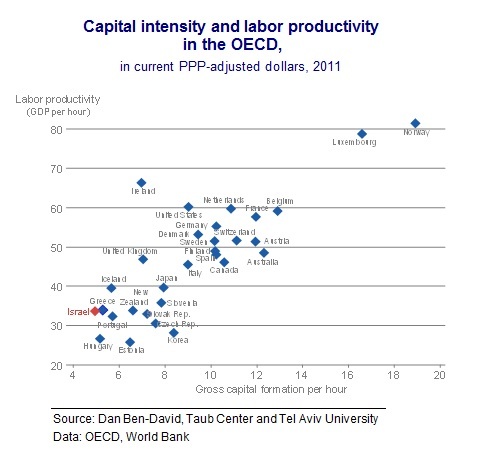 The strong positive relationship between capital formation and labor productivity is reflected in the figure – as is Israel’s very low position with regard to both in comparison with the remaining OECD countries. So it should come as no surprise that a country with relatively low national levels of physical and human capital is exhibiting problematic productivity growth at the national level. One aspect of the poor state of Israel’s physical capital infrastructure is its road and rail network that have been neglected for decades (despite some increased investments in recent years). As shown in the State of the Nation in Pictures 2013, while Israel has roughly half the vehicles per capita as the OECD average, it has over twice the congestion on its roads. If sitting many hours in traffic makes it necessary to hire more truck drivers to transport the same number of goods – for example – then it should be evident that the driver’s productivity is subsequently lower, as must be the worker’s level of compensation. The use of rail in Israel is even more limited in comparison with other developed countries. The issues of relatively low employment, many more work hours by those who do work, and productivity that is steadily falling relative to the leading developed countries, all combine to create a growing national burden on the shoulders of those who bear it – a major issue that needs to be addressed systemically by Israel’s top policy makers. 1 Senor, Dan and Saul Singer (2011), The Start-Up Nation: the Story of Israel’s Economic Miracle, A council on Foreign Relations book, Twelve.